American West Homes – Targeted Display Advertising | ASTRALCOM - Content Strategy, Conversion Marketing and Customer Acquisition. American West Homes – Targeted Display Advertising | ASTRALCOM – Content Strategy, Conversion Marketing and Customer Acquisition. 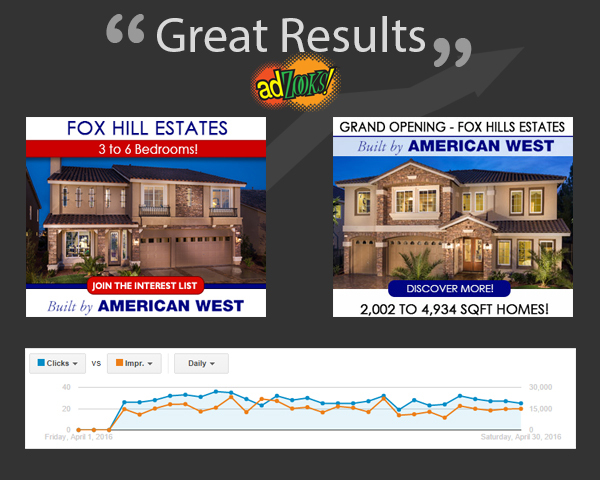 “Great results!” was the response back from American West Homes. Targeted display is such a critical component of the marketing mix and typically reaches homebuyers at different stages of the home buying journey. As such, adZooks! delivers a higher conversion rate for homebuilders. adZooks! is a unique display advertising model because it charges a flat rate instead of the more traditional cost-per-thousand (CPM) model. This really helps our clients to budget for sales promos, long-term campaigns and is generally a more favorable price model than CPM. Read more about adZooks! in this post about American West Homes.